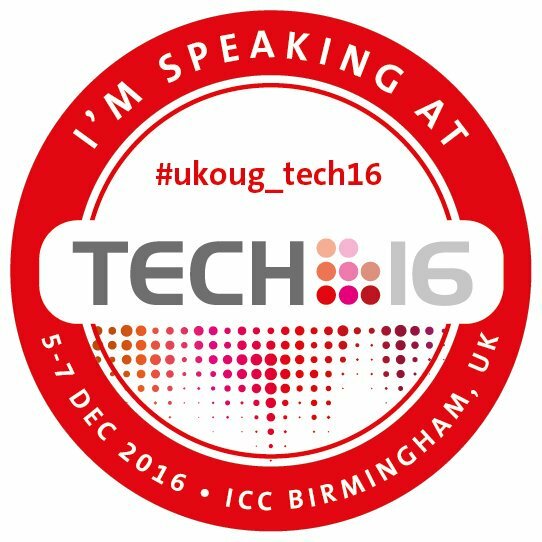 This year as always Rittman Mead is coming to UKOUG Tech 16 with a strong presence and a great line up of sessions covering OBIEE, ODI, Kafka, advanced visualisation and more. And yes, there will be Cloud! There is no better way to finish a conference than with two success stories from our recent engagements! If the OBIEE 12c upgrade depicted in Francesco's session is something you are also looking to achieve, we would be pleased to tell you more about it and to see how we can help you. And of course, we are also happy to answer any questions if you see us in sessions or around the conference. You can find some of us during the Oracle Big Data meetup (Monday evening) or the ODTUG Data and Analytics Switzerland meetup (Tuesday evening). So see you in two weeks in Birmingham ! June is the perfect month: summer begins, major football (and futbol) tournaments are in full swing, and of course, KScope16 is on! Rittman Mead have participated in many of the past KScope conferences and will continue that tradition this year with a wide range of presentation and training topics across the Business Intelligence, Data Warehousing, Big Data, and Advanced Analytics subject areas. This year the event is held in Chicago at the Sheraton Grand Chicago, a great location right on the river and a short distance from sights such as the Navy Pier and Magnificent Mile. And, as always, there will be some great networking opportunities throughout the week. This year, we’re pleased to congratulate our own Becky Wagner (of Becky’s BI Apps Corner) on her graduation from the ODTUG Leadership Program. This is the third class to complete the program, which aims to build leadership skills, confidence, and work/life balance skills, amongst many other things, throughout the 9 month class duration. Well done, Becky! You’ll be able to find her and the rest of the 2016 Leadership class at the Career Community/Leadership Program Information Breakfast – Monday, June 27th 7:30AM at the Sheraton hotel main dining area. They will be kicking off the application season for the 2017 Leadership Program and providing further information about the new ODTUG career program as well. The rest of the Rittman Mead attendees will be presenting one or more sessions during the week. The week kicks off with my talk Monday on GoldenGate and Kafka integration using the new Oracle GoldenGate for Big Data release 12.2. The topic of this session, real-time data streaming, provides a great solution for the challenging task of ingesting data from multiple different sources, and different structures, and making that data readily available for others in the organization to use. By combining GoldenGate, Oracle’s premier data replication technology, and Apache Kafka, the latest open-source streaming and messaging system for big data, we can implement a fast, durable, and scalable solution. Tuesday morning, Charles Elliott, Managing Director of Rittman Mead in the US, will begin the first of his two-part hands on lab sessions on Free Form Data Visualizations. This hands-on introduction to all things visual in OBIEE’s new Visual Analyzer (VA) will allow attendees to see the top reporting features within the current release while also understanding the core differences between OBIEE’s previous reporting platform and what’s available now. In addition to creating some of the most eye-catching visualizations the new tool has to offer, this session will highlight new OBIEE 12c features such as mapping, advanced analytics, and an overview of the brand-new web catalog. Whether you are just interested in what’s new in free-form Oracle BI visualizations or preparing for an upgrade, this session is for you! During the lunch and learn sessions you can find me moderating the BI and Data Warehousing panel and Mark Rittman will be moderating the Big Data and Advanced Analytics crew. Grab a lunch and join us! 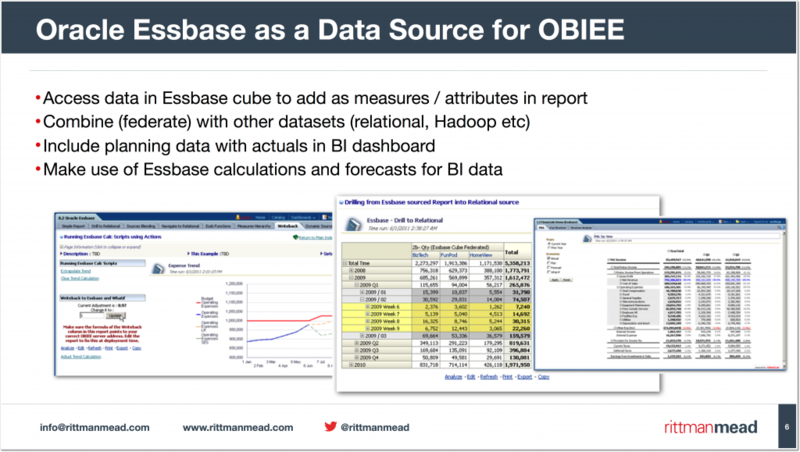 The remainder of Rittman Mead sessions fall on Wednesday, with some interesting topics around Big Data Discovery, OBIEE branding and Essbase integration, and the Kimball ETL Subsystems. Also, the second day of the Free Form Data Visualizations HOL will be held on Wednesday afternoon. It all starts with Mark Rittman presenting “OBIEE 12c: What’s New for Integration and Reporting Against EPM Sources”. He’ll dig into interesting new features around OBIEE 12c and Essbase integration, including improvements around using Essbase as a query acceleration layer and general improvements around usability and RPD/Outline integration. Come to this session to see what they are, how they affect OBIEE/Essbase integration, and where this initiative may be going over time. Following Mark and his dive into OBIEE and Essbase on Wednesday will be my session, “A Walk Through the Kimball ETL Subsystems with Oracle Data Integration”, with a focus on how to implement the ETL Subsystems using Oracle Data Integration solutions. As you may know, Ralph Kimball, dimensional modeling and data warehousing expert and founder of The Kimball Group, spent much of his career working to build an enterprise data warehouse methodology that can meet analytical reporting needs. His book, “The Data Warehouse ETL Toolkit,” is a guide for many ETL developers. This session will walk you through his ETL Subsystem categories, describing how the Oracle Data Integration products (Oracle Data Integrator, GoldenGate, & Enterprise Data Quality) are perfectly suited for the Kimball approach. After lunch, Andy Rocha and Pete Tamisin will dive into “How to Brand and Own Your OBIEE Interface: Past, Present, and Future”. In this presentation, they will explore the different techniques in branding and customizing your OBIEE environment in different versions: 11.1.1.7, 11.1.1.9, and 12c. What that really means is they will talk about how to brand the interface in a thoughtful way… not just throwing the company’s colors on the screen, but thinking about what will actually make the application more attractive and useful for the user community. Closing out the Rittman Mead Wednesday sessions is Mark Rittman with his unique look at machine learning and advanced visualizations using Oracle Big Data Discovery (BDD). Mark will use the BDD Shell, pySpark, and Jupyter to ingest, process and run machine learning routines on IoT and smart home data, which he has been collecting over the past year. Oracle Big Data Discovery provides a graphical environment for cataloging, searching, and displaying data from Hadoop and other sources along with some basic data wrangling features and display options. In this session, he’ll look at how BDD can be extended using the aforementioned APIs to cover more advanced predictive modeling, machine learning, and data science tasks, and how the graphics API can be used to add custom D3 advanced visualizations for your datasets and analyses. I’m definitely looking forward to this one! We’re all looking forward to attending the event in Chicago this year and can’t wait for next week! If you’d like to get together to discuss any of the above topics we’re presenting, or anything data integration or BI related, feel free to reach out via email (info@rittmanmead.com), twitter (@mRainey) or drop a note in the comments below. Hope to see you there! The post Rittman Mead at KScope16 appeared first on Rittman Mead Consulting. This year, we're pleased to congratulate our own Becky Wagner (of Becky's BI Apps Corner) on her graduation from the ODTUG Leadership Program. This is the third class to complete the program, which aims to build leadership skills, confidence, and work/life balance skills, amongst many other things, throughout the 9 month class duration. Well done, Becky! You'll be able to find her and the rest of the 2016 Leadership class at the Career Community/Leadership Program Information Breakfast - Monday, June 27th 7:30AM at the Sheraton hotel main dining area. They will be kicking off the application season for the 2017 Leadership Program and providing further information about the new ODTUG career program as well. It all starts with Mark Rittman presenting "OBIEE 12c: What's New for Integration and Reporting Against EPM Sources". He'll dig into interesting new features around OBIEE 12c and Essbase integration, including improvements around using Essbase as a query acceleration layer and general improvements around usability and RPD/Outline integration. Come to this session to see what they are, how they affect OBIEE/Essbase integration, and where this initiative may be going over time. Following Mark and his dive into OBIEE and Essbase on Wednesday will be my session, “A Walk Through the Kimball ETL Subsystems with Oracle Data Integration", with a focus on how to implement the ETL Subsystems using Oracle Data Integration solutions. As you may know, Ralph Kimball, dimensional modeling and data warehousing expert and founder of The Kimball Group, spent much of his career working to build an enterprise data warehouse methodology that can meet analytical reporting needs. His book, “The Data Warehouse ETL Toolkit,” is a guide for many ETL developers. This session will walk you through his ETL Subsystem categories, describing how the Oracle Data Integration products (Oracle Data Integrator, GoldenGate, & Enterprise Data Quality) are perfectly suited for the Kimball approach. After lunch, Andy Rocha and Pete Tamisin will dive into "How to Brand and Own Your OBIEE Interface: Past, Present, and Future". In this presentation, they will explore the different techniques in branding and customizing your OBIEE environment in different versions: 11.1.1.7, 11.1.1.9, and 12c. What that really means is they will talk about how to brand the interface in a thoughtful way… not just throwing the company’s colors on the screen, but thinking about what will actually make the application more attractive and useful for the user community. 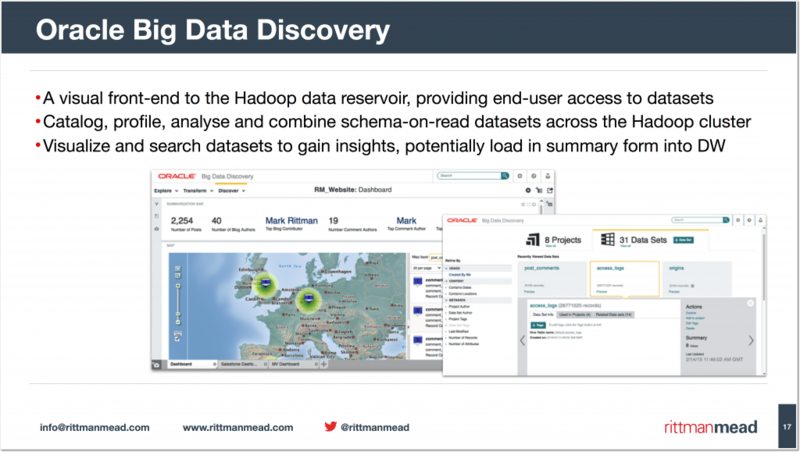 Closing out the Rittman Mead Wednesday sessions is Mark Rittman with his unique look at machine learning and advanced visualizations using Oracle Big Data Discovery (BDD). Mark will use the BDD Shell, pySpark, and Jupyter to ingest, process and run machine learning routines on IoT and smart home data, which he has been collecting over the past year. Oracle Big Data Discovery provides a graphical environment for cataloging, searching, and displaying data from Hadoop and other sources along with some basic data wrangling features and display options. In this session, he'll look at how BDD can be extended using the aforementioned APIs to cover more advanced predictive modeling, machine learning, and data science tasks, and how the graphics API can be used to add custom D3 advanced visualizations for your datasets and analyses. I'm definitely looking forward to this one! We're all looking forward to attending the event in Chicago this year and can't wait for next week! If you'd like to get together to discuss any of the above topics we're presenting, or anything data integration or BI related, feel free to reach out via email (info@rittmanmead.com), twitter (@mRainey) or drop a note in the comments below. Hope to see you there! It’s that time of year again when Oracle technologists from around the world gather in Las Vegas, NV to teach, learn, and, of course, network with their peers. The Collaborate conference, running for 10 years now, has been a collaboration, if you will, between the Independent Oracle Users Group (IOUG), Oracle Applications Users Group (OAUG) and Quest International Users Group (Quest), making it one of the largest user group conferences in the world. Rittman Mead will once again be in attendance, with two data integration focused presentations by me over the course of the week. My first session, “A Walk Through the Kimball ETL Subsystems with Oracle Data Integration”, scheduled for Monday, April 11 at 10:30am, will focus on how we can implement the ETL Subsystems using Oracle Data Integration solutions. As you know, Big Data integration has been the hot topic over the past few years, and it’s an excellent feature in the Oracle Data Integration product suite (Oracle Data Integrator, GoldenGate, & Enterprise Data Quality). But not all analytics require big data technologies, such as labor cost, revenue, or expense reporting. Ralph Kimball, dimensional modeling and data warehousing expert and founder of The Kimball Group, spent much of his career working to build an enterprise data warehouse methodology that can meet these reporting needs. His book, “The Data Warehouse ETL Toolkit“, is a guide for many ETL developers. This session will walk you through his ETL Subsystem categories; Extracting, Cleaning & Conforming, Delivering, and Managing, describing how the Oracle Data Integration products are perfectly suited for the Kimball approach. I go into further detail on one of the ETL Subsystems in an upcoming IOUG Select Journal article, titled “Implement an Error Event Schema with Oracle Data Integrator”. The Select Journal is a technical magazine published quarterly and available exclusively to IOUG members. My recent post Data Integration Tips: ODI 12c Repository Query – Find the Mapping Target Table shows a bit of the detail behind the research performed for the article. If you’re not familiar with the Kimball approach to data warehousing, I definitely would recommend reading one (or more) of their published books on the subject. I would also recommend attending one of their training courses, but unfortunately for the data warehousing community the Kimball Group has closed shop as of December 2015. But hey, the good news is that two of the former Kimball team members have joined forces at Decision Works, and they offer the exact same training they used to deliver under The Kimball Group name. 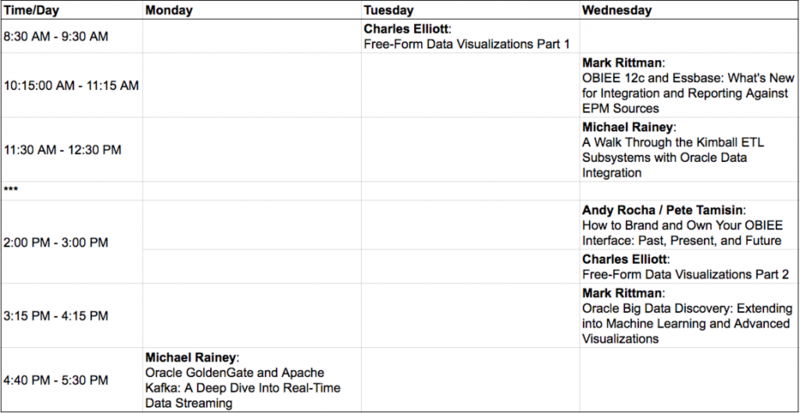 On Thursday, April 14 at 11am, I will dive into the recently released Oracle GoldenGate for Big Data 12.2 in a session titled “Oracle GoldenGate and Apache Kafka: A Deep Dive into Real-Time Data Streaming”. The challenge for us as data integration professionals is to combine relational data with other non-structured, high volume and rapidly changing datasets, known in the industry as Big Data, and transform it into something useful. Not just that, but we must also do it in near real-time and using a big data target system such as Hadoop. The topic of this session, real-time data streaming, provides us a great solution for that challenging task. By combining GoldenGate, Oracle’s premier data replication technology, and Apache Kafka, the latest open-source streaming and messaging system for big data, we can implement a fast, durable, and scalable solution. If you plan to be at Collaborate next week, feel free to drop me a line in the comments, via email at michael.rainey@rittmanmead.com, or on Twitter @mRainey, I’d love to meet up and have a discussion around my presentation topics, data integration, or really anything we’re doing at Rittman Mead. Hope to see you all there! The post Rittman Mead at Collaborate 16: Data Integration Focus appeared first on Rittman Mead Consulting. A few months before the start of the 2014 World Cup, Jon Mead, Rittman Mead’s CEO, asked me to come up with a way to showcase our strengths and skills while leveraging the excitement generated by the World Cup. With this in mind, my colleague Pete Tamisin and I decided to create our own game-tracking page for World Cup matches, similar to the ones you see on popular sports websites like ESPN and CBSSports, with one caveat: we would build the game-tracker inside an OBIEE dashboard. Unfortunately, after several long nights and weekends, we weren’t able to come up with something we were satisfied with, but we learned tons along the way and kept a lot of the content we created for future use. That future use came several months later when we decided to create our own soccer match (“The Rittman Mead Cup”) and build a game-tracking dashboard that would support this match. We then had the pleasure to present our work in a few industry conferences, like the BI Forum in Atlanta and KScope in Hollywood, Florida. Recently I had the privilege of delivering that presentation one last time, at Georgia Oracle Users Group’s Tech Day 2016. With the right amount of silliness (yes, The Rittman Mead cup was played/acted by our own employees), this presentation allowed us to discuss with the audience our approach to designing a “sticky” application; meaning, an application that users and consumers will not only find useful, but also enjoyable, increasing the chances they will return to and use the application. We live in an era where nice, fun, pretty applications are commonplace, and our audience expects the same from their business applications. Validating the numbers on the dashboard is no longer enough. We need to be able to present that data in an attractive, intuitive, and captivating way. So, throughout the presentation, I discussed with the audience the thoughtful approach we used when designing our game-tracking page. We focused mainly on the following topics: Serving Our Consumers; Making Life Easier for Our Designers, Modelers, and Analysts; and Promoting Process and Collaboration (the latter can be accomplished with our ChitChat application). Our job would have been a lot easier if ChitChat were available when we first put this presentation together…. Finally, you can find the slides for the presentation here. Please add your comments and questions below. There are usually multiple ways of accomplishing the same thing, so I’d be grateful to hear how you guys are creating “stickiness” with your users in your organizations. The post Use OBIEE to Achieve Your GOOOALS!!! – A Presentation for GaOUG appeared first on Rittman Mead Consulting.